Of course, I won’t be springing anywhere for the next few days! 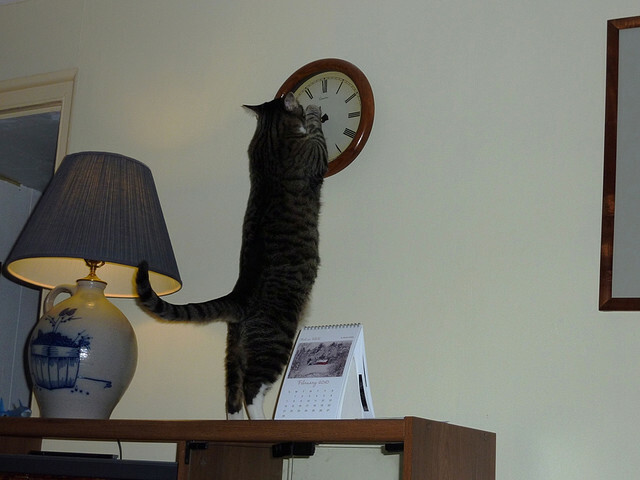 Turning the clocks ahead an hour is a love-hate relationship for me. I LOVE that the sun now will set later, and I will see the light of day longer after I get out of work. However, I hate losing the hour of sleep. It really messes up my internal clock and schedule. I have already gone around and changed all my clocks. They now are showing 12:28 a.m. Would it have been better for me to go to bed an hour ago? Yes! Will I stay up way too late tonight? Yes! At 9:00 pm tonight, I could hardly keep my eyes open – but I now have a second wind and am wide awake and will not be going to bed for at least an hour. I am bad – almost as bad as Molly who will most likely waking me up at the crack of dawn – not many hours after I have gone to bed. She is a cute “little” thing though – so what can I say!